Apolinario Mabini (July 23, 1864–May 13, 1903) was the first prime minister of the Philippines. Known for his powerful intellect, political savvy, and eloquence, Mabini was called the brains and conscience of the revolution. Before his untimely death in 1903, Mabini's work and thoughts on the government shaped the Philippines' fight for independence over the next century. Published Works: "El Simil de Alejandro," "Programa Constitucional de la Republica Filipina," "La Revolución Filipina"
Notable Quote: "Man, whether or not he wishes, will work and strive for those rights with which Nature has endowed him, because these rights are the only ones which can satisfy the demands of his own being." Apolinario Mabini y Maranan was born the second of eight children around 43 miles south of Manila. His parents were very poor: His father Inocencio Mabini was a peasant farmer and his mother Dionisia Maranan supplemented their farm income as a vendor at the local market. As a child, Apolinario was remarkably intelligent and studious. Despite his family's poverty, he studied at a school in Tanawan under the tutelage of Simplicio Avelino, working as a houseboy and tailor's assistant to earn his room and board. He then transferred to a school run by the famed educator Fray Valerio Malabanan. In 1881, at the age of 17, Mabini won a partial scholarship to Manila's Colegio de San Juan de Letran. Once again he worked throughout his schooling, this time by teaching younger students Latin. Apolinario earned his Bachelor's degree and official recognition as a Professor of Latin in 1887. He went on to study law at the University of Santo Tomas. From there, Mabini entered the legal profession in order to defend poor people. He had himself faced discrimination in school from fellow students and professors, who picked on him for his shabby clothing before they realized how brilliant he was. It took Mabini six years to complete his law degree since he worked long hours as a law clerk and a court transcriptionist in addition to his studies. He ultimately earned his law degree in 1894 at the age of 30. While at school, Mabini supported the Reform Movement. This conservative group was mainly made up of middle- and upper-class Filipinos calling for changes to Spanish colonial rule, rather than outright Philippine independence. Intellectual, author, and physician José Rizal was also active in this movement. In September of 1894, Mabini helped establish the reformist Cuerpo de Comprimisarios—the "Body of Compromisers"—which sought to negotiate better treatment from Spanish officials. Pro-independence activists, mostly from the lower classes, joined the more radical Katipunan Movement instead. Established by Andrés Bonifacio, the Katipunan movement advocated armed revolution against Spain. In 1895, Mabini was admitted to the lawyer's bar and worked as a newly-minted lawyer in the Adriano law offices in Manila while he also served as the secretary of the Cuerpo de Comprimisarios. However, early in 1896, Apolinario Mabini contracted polio, which left his legs paralyzed. Ironically, this disability saved his life that autumn. The colonial police arrested Mabini in October of 1896 for his work with the reform movement. He was still under house arrest at the San Juan de Dios Hospital on December 30 of that year, when the colonial government summarily executed José Rizal, and it's believed that Mabini's polio likely kept him from the same fate. Between his medical condition and his imprisonment, Apolinario Mabini was not able to participate in the opening days of the Philippine Revolution. Nevertheless, his experiences and the execution of Rizal radicalized Mabini and he turned his keen intellect to the issues of revolution and independence. In April of 1898, he penned a manifesto on the Spanish-American War, presciently warning other Philippine revolutionary leaders that Spain would likely cede the Philippines to the United States if it lost the war. He urged them to continue to fight for independence. This paper brought him to the attention of General Emilio Aguinaldo, who had ordered the execution of Andrés Bonifacio the previous year and had been driven into exile in Hong Kong by the Spanish. The Americans hoped to use Aguinaldo against the Spanish in the Philippines, so they brought him back from his exile on May 19, 1898. Once ashore, Aguinaldo ordered his men to bring the author of the war manifesto to him, and they had to carry the disabled Mabini over the mountains on a stretcher to Cavite. Mabini reached Aguinaldo's camp on June 12, 1898, and soon became one of the general's primary advisers. That same day, Aguinaldo declared the Philippines' independence, with himself as the dictator. On July 23, 1898, Mabini was able to talk Aguinaldo out of ruling the Philippines as an autocrat. He convinced the new president to establish a revolutionary government with an assembly rather than a dictatorship. In fact, Apolinario Mabini's power of persuasion over Aguinaldo was so strong that his detractors called him the "Dark Chamber of the President," while his admirers named him "the Sublime Paralytic." Because his personal life and morality were difficult to attack, Mabini's enemies in the new government resorted to a whispering campaign to slander him. Jealous of his immense power, they started a rumor that his paralysis was due to syphilis, rather than polio—despite the fact that syphilis does not cause paraplegia. Even as these rumors spread, Mabini continued to work toward fashioning a better country. He wrote most of Aguinaldo's presidential decrees. He also molded policy on the organization of the provinces, the judicial system, and the police, as well as property registration and military regulations. Aguinaldo appointed him to the Cabinet as Secretary of Foreign Affairs and President of the Council of Secretaries. In these roles, Mabini exercised significant influence over the drafting of the first constitution for the Philippine Republic. Mabini continued moving up the ranks in the new government with his appointment as both the prime minister and foreign minister on January 2, 1899, right when the Philippines were on the brink of yet another war. On March 6 of that year, Mabini began negotiations with the United States over the Philippines' fate. Now that the U.S. had defeated Spain, both the U.S. and the Philippines were already engaged in hostilities, but not in a declared war. Mabini sought to negotiate autonomy for the Philippines and a ceasefire from foreign troops, but the U.S. refused the armistice. In frustration, Mabini threw his support behind the war effort and on May 7 he resigned from Aguinaldo's government, with Aguinaldo declaring war less than a month later on June 2. As the declared war began, the revolutionary government at Cavite had to flee. Once again Mabini was carried in a hammock, this time to the north, 119 miles to Nueva Ecija. On December 10, 1899, he was captured there by Americans and made a prisoner of war in Manila until the following September. "Man, whether or not he wishes, will work and strive for those rights with which Nature has endowed him, because these rights are the only ones which can satisfy the demands of his own being. To tell a man to be quiet when a necessity not fulfilled is shaking all the fibers of his being is tantamount to asking a hungry man to be filled while taking the food which he needs." The Americans immediately re-arrested him and sent him into exile in Guam when he refused to swear fealty to the United States. During his long exile, Apolinario Mabini wrote "La Revolucion Filipina," a memoir. Worn down and sickly and fearing that he would die in exile, Mabini finally agreed to take the oath of allegiance to the United States. "After two long years I am returning, so to speak, completely disoriented and, what is worse, almost overcome by disease and sufferings. Nevertheless, I hope, after some time of rest and study, still to be of some use, unless I have returned to the Islands for the sole purpose of dying." Sadly, his words were prophetic. Mabini continued to speak and write in support of Philippine independence over the next several months. He fell ill with cholera, which was rampant in the country after years of war, and died on May 13, 1903, at only 38 years old. Like fellow Philippine revolutionaries José Rizal and Andrés Bonifacio, Mabini did not live to see his 40th birthday. Yet in his short career, he had an outsize role in shaping the revolutionary government and the future of the Philippines. The Museo ni Apolinario Mabini in Tanauan, Philippines exhibits the life and deeds of Mabini. 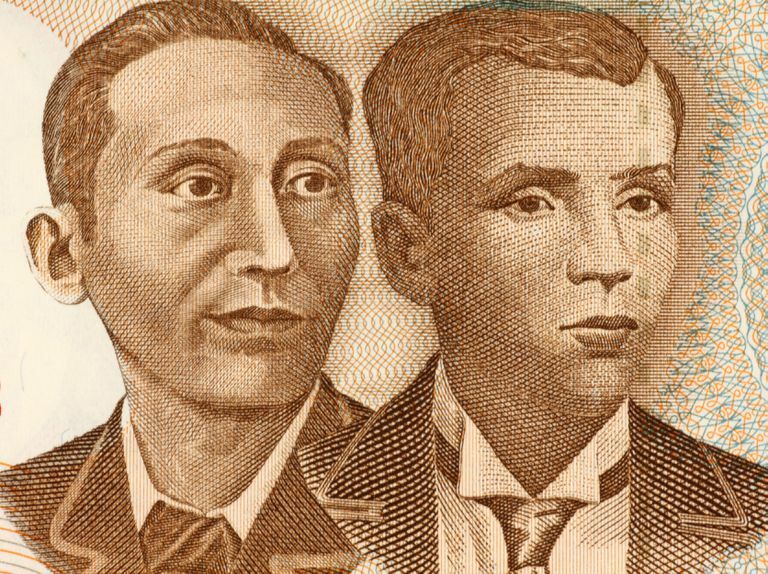 Mabini's face has been on the Philippine ten peso coin and ten peso bill. The Gawad Mabini is an honor given to Filipinos for distinguished foreign service. “Apolinario Mabini, by Leon Ma. Guerrero.” Presidential Museum and Library, malacanang.gov.ph/8029-apolinario-mabini-by-leon-ma-guerrero/. Joaquin, Nick. “Mabini the Mystery." Presidential Museum and Library, malacanang.gov.ph/8027-mabini-the-mystery-by-nick-joaquin/.